Hope's Cafe: SGSG #4-Shielo Hair Care Giveaway!! What would make a great gift for just about any woman or girl? Hair care products, that's what! Shielo is a great company with some really amazing products-you may remember earlier this year when I reviewed a few items from their product lineup. I absolutely love the Volume Bounce Style Creme, as it's one of very few curl cremes that really defines and holds curls while keeping your hair soft and natural looking. That's off the subject though, as this post isn't about the products I reviewed a few months ago-it's about the chance for one of you to win some awesome Shielo products for yourself! (Or, since this is a gift guide, you could choose to gift it this holiday season). Before we get to the giveaway, here's some information about how Shielo got started. "Shielo Hair Technology & Care was created in New York City in 2001 when salon industry leaders modernized the hair care industry by providing new technologies in the first voluminous technologies. A need was identified among top salons in New York City and their clientele for more voluminous styles, while including the effort to enhance and fortify hair care products with volumizing and color protecting elements. In 2007, the Shielo brand was extended from salons into clients' homes with scientifically superior products designed to invigorate hair for all styles. The Volume Collection was the first to debut online in 2007, much to the delight of women who craved high performance product that addressed the needs of limp and weak hair. Towards the end of the 2008, the Color Protect line was launched which today remains a product winner in many categories for color protection and shine." 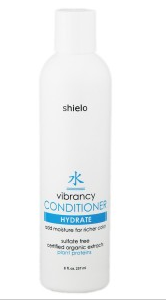 Shielo HYDRATE Shampoo and Conditioner!! I'd love to have the Volume Collection - Shampoo, Conditioner, Hairspray and Style Creme. I entered your 2 Coupons for free Bertolli Frozen Meals giveaway. I would like the sealing mist. I liked the complexion kit. All the girls on my Christmas wist would certainly welcome their Hydrate Shampoo and Conditioner to combat this harsh winter air. I'd also like to try the Hydrate sealing mist.